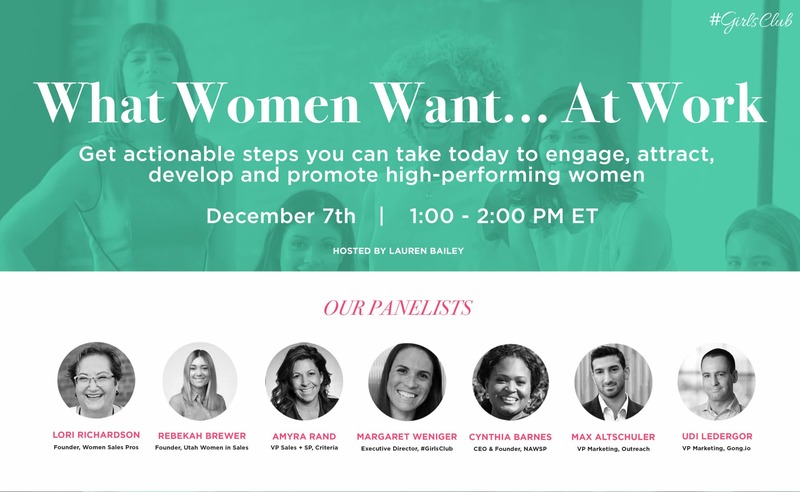 Mark Your Calendars For What Women Want…At Work! Everyone’s talking about it. Even though studies have shown that women outperform men in sales*, they still aren’t being hired, retained and promoted at the same rate as men. This could slash women’s confidence and build up a “bro culture” without you even realizing it’s happening, leading your female talent to look elsewhere for something they feel is more attainable. There’s plenty of debate and buzz surrounding what causes this “bro culture” and if it actually exists. But, it seems to us like the time for paying talking is over, and the time for taking action is here! talk with organizational leaders who are doing it right and giving you the tricks on how to do the same. Nowhere else can you get a checklist of action items you can use RIGHT NOW to attract more qualified women, and retain those women with career development efforts, and promote them into leadership. Not only is diversity the cultural future of your company, but a Harvard Business Review study found that companies with even just a 30% female share in leadership can increase profitability by 15%! Don’t get left behind! Register now to claim your spot! We’ll see you on the 7th! #GirlsClub Has Launched And It’s BIG!